The sole source of income, Financial Income declined by 25% to total $154,000 from $205,000 for the previous financial year. An exchange gain of $210,000 was realized relative to $856,000 for the 2016 financial year. Other expenses amounted to $5.42 million, 35% less than the $8.35 million recorded for the year ending May 31st, 2016. The company reported net loss of $5.24 million, this compares with the loss of $7.47 million for the same period last year. Net loss per share was 0.96 cents for the year ending May 31st, 2017 (2016: loss per share of 1.37 cents). The number of shares used in the calculations is 546,000,000. Total current assets for the year ending May 31st, 2017 amounted to $53 million, down from $58.23 million in May 2016. This was as a result of the decline in Resale Agreement from $8.43 million to $3.43 million. 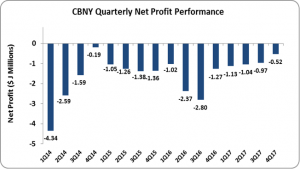 Shareholders’ Deficit amounted to $47.66 million, an increase relative to the $42.42 million deficit reported in 2016, resulting from the increase in Ciboney’s accumulated deficit from $418.07 million to $423.31 million. This resulted in a negative book value per share of $0.09 in 2017 relative to $0.08 in 2016.